FULTON, NY – As it has for the past four years, the United Way of Greater Oswego County’s Donor Incentive Program is proving to be a worthwhile addition to many companies’ employee campaigns in support of United Way. Lois Luber (left), resource development director with United Way, meets with sponsors for the agency’s 2012 / 2013 Annual Campaign Incentive Program. 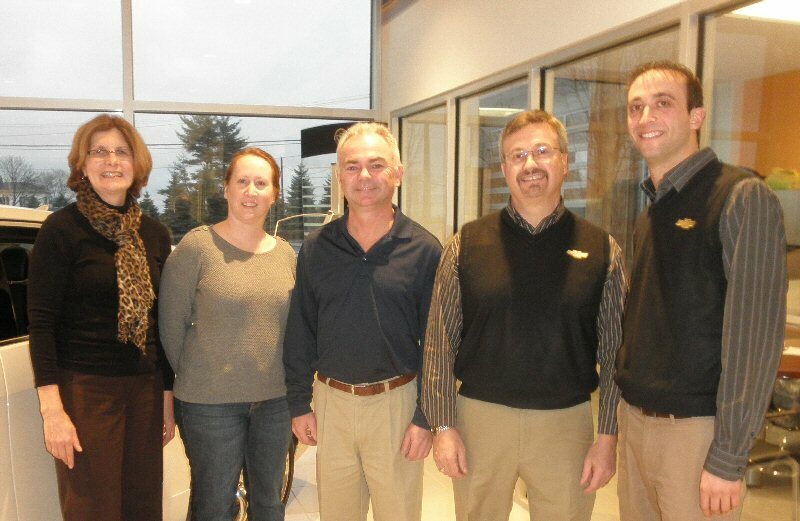 Pictured with Luber from left are: Jill Lyon with Constellation Energy Nuclear Group’s Nine Mile Point Nuclear Station, Brian Finn with Entergy, and Chris and Rich Burritt from Burritt Motors in Oswego. Absent from the photo is Kevin Riley of Planned Results, Inc. The Donor Incentive Campaign allows those who donate to the United Way’s 2012 / 2013 Annual Campaign the opportunity to win special prizes as an incentive for supporting their United Way. According to Luber, this year United Way is focused on having gift cards to area restaurants, grocery stores and gas stations as the prizes that donors to the United Way’s 2012 / 2013 Annual Campaign will be eligible to win. “We are pleased to be able to offer these prizes to our donors and are appreciative of the support we have received from those who helped make these prizes available including; Burritt Motors, Constellation Energy Nuclear Group’s Nine Mile Point Nuclear Station, Entergy, and Planned Results,” said Luber. Prize drawings will be held in February.